The Formentera Council wishes to present its catalogue of adult-education courses and workshops. The goal is to offer a wide variety to meet the educational and recreational demand generated by citizens resident on the island. 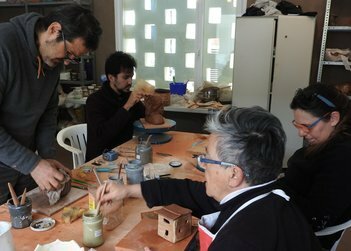 Year after year, there is a training offer in art workshops, such as the creation and painting workshop by Teresa Matilla, wood carving by Aaron Keydar and ceramics given by Remedios Castillo and Silvia Jobani. These courses begin in November and end in March. As a new feature, this year Catalina Juan Verdera will offer a workshop of embroidery and punto canario that will unfold November to March. All information and signups from next Monday, September 25, at the Citizen's Information Office (OAC). Given its good reception, this year it is repeated the beginners course in Photoshop to learn the basic tools of this indispensable image retouching program. The course taught by Sergio Torres will take place during the month of February. The other new draw of the year will be the beginners' and advanced courses of digital photography Jose Antonio Arribas. Both courses will be intensive and will have a theoretical and practical component, which will allow students to learn different photographic techniques inside and outside the classroom. This course is aimed at all those who want to get the most out of their camera or work in-depth with different photographic disciplines. For all the details and to register also from next Monday, September 25 at the OAC. Concerning performing arts, the Espai_F cultural association with its Theater Classroom has organized, on the one hand, the theatrical interpretation workshop for adults, imparted by Àngels Escandell and Miquel Costa and, on the other band, the dance and movement workshop run by Valeria Del Vecchio. The social welfare office organizes courses for unemployed people. This year there is a course in socio-sanitary care for dependent people in social institutions that will be held from mid-October to February. And the course in social and cultural integration that happens twice a year, in November and March. To get more info and to learn how to register, visit the social welfare office (àrea de Benestar Social). As every year, the Council also offers a yoga course, taught by Susanne Laier. The course begins in November and ends in April and the classes will take place at the Sala de Cultura (Cinema) and the Sant Ferran de ses Roques primary school. For details on it, including information on how to register, visit the OAC from September 25. In addition, the Casa del Poble de la Mola offers a series of workshops dedicated to sport and health, such as tai-chi, pilates, maintenance gymnastics, yoga, meditation and dance workshops. All the workshops will begin in November. For information and inscriptions interested parties can go directly to the Casa del Pueblo de la Mola. Aspiring language learners will this year find courses in Catalan, Italian and English. Free Catalan courses will be provided by the Council's language service, at levels A2, B1, B2, C1 and C2. Signups run September 25 to October 11 in ​​the culture office of the Formentera Council. The courses begin on October 16, and the end of the course will be adapted to the call for official tests scheduled for January and February 2017. There will also be English courses, given by Nancy McConachie, and from Italian, given by Rodolfo Taccheo. English classes begin January in the afternoon, and they offer a basic level and an advanced level. And Italian courses start in January, in the morning, and offer a basic and advanced level. Registration of these language courses can also be done at the OAC. This year, the Sant Ferran retirees' club will also offer courses and workshops exploring traditional activities. In this way, anyone who wants can be applied in the sewing workshops, or learn to chain chairs, to make baskets or to spool. In addition, there is also a course for cooking, sandwich making and a practical course to learn to wear traditional clothing, mainly aimed at dance groups. These courses have the collaboration of the Heritage office of the Formentera Council. All courses start in November. For more information, those interested can contact the retirees' club. Pre-enrollment will open on September 25. For workshops that begin in November, such as ceramics, painting and wood carvings, the registration can be done until October 20. For English and Italian courses, which begin in January, the registration will be open until December 15. With regard to the Photoshop course that takes place in February, those interested can register until January 15.